For my first fermentation in Massachusetts, I decided to conduct a little experiment on the state's native fruit--the cranberry. One deficit that many people encounter with fruit wines is a lack of body. The wines just don't have a very long finish. In my winemaking studies, I've come across several suggestions for ameloriating the problem by adding chopped (1) raisins, (2) grape juice concentrate, or (3) bananas to the must. In 2006, I made a cranberry wine with a recipe that called for golden raisins. The final product was OK. I had to sweeten it to a residual sugar level of 2.5% to balance the tartness and to cover up a metallic tang that came from letting the wine sit on the gross lees too long. The biggest issue I faced with that wine was simply getting the fermentation to occur in the first place. I didn't quite appreciate how much sulfites are in golden raisins, and added additional meta bisulfite to the must to sanitize the must prior to adding the wine yeast. Needless to say, it took 3 packets of wine yeast (1 is usually plenty) and a lot of aeration effort to kick off the party. For my second attempt, I wanted to avoid my previous mishaps and conduct a little experiment to see how grape juice and bananas affect the body in comparison to each other and raisins. First, I lowered the amount of cranberries per gallon from 4 lbs/gal in the 2006 vintage to 3 lbs/gal. Second, I carefully controlled the acid levels in the must to target a final total acid of ~6.0 mg/mL. Third, I added only half the recommended dosage of potassium metabisulfite to the must prior to the yeast to sanitize the must. 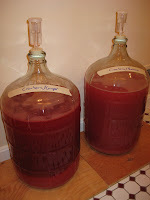 Fourth, I decided to make 2 side-by-side 3 gal batches of a cranberry/banana and cranberry/grape juice wines. To aim for a fruity dry wine, I elected to use Red Star Cote Des Blanc wine yeast for both batches. Both batches were cold-soaked for 24 hours prior to addition of the yeast starter, stirred 2-3 times per day to keep the fermentation cap moist, and pressed at Brix = ~6. They are currently finishing fermentation in carboys in my bathroom (the warmest place in the house). Update (1/12/08): After 2 weeks, both wines are at Brix = 0.5 to 0.9. Almost done! The banana and Niagara grape juice lent their distinct aromas to the respective musts. The banana aromas seemed to have dissapated during the fermentation more than the grape juice. The Cranberry/Niagara grape must seemed to be a brighter red, perhaps due to the lower pH. The Cranberry/banana must was red, but it seemed muted by the bananas. The Cranberry/banana was more difficult to press with a greater volume of residual solids that retained more liquid. However, after pressing, it has a smaller volume of lees on the bottom of the carboy. Interestingly, the Cranberry/grape wine has fermented at a slightly faster rate. I started it 24 hours later, but the rate of decrease in the Brix level caught up and passed the Cranberry/banana on day 4. I won't have a final answer until later this spring. At the present fermentation rate, I'm expecting secondary fermentation to last for another 1-2 weeks. I'll draw final conclusions on the respective bodies after clearing and aging for at least 6 months. Stay tuned for the results!